The gaps in the Thames Ditton Parish Registers led me to search out other sources of information and a visit to the Surrey Records Office at Kingston-upon-Thames (now the Surrey History Center at Woking) located the Parish Overseers Poor Rate Account Books, where I was delighted to discover an entry in 1755 for James Howard [P91] who had been assessed to pay a poor rate of 5 shillings. This was the discovery I was seeking which seemed to confirm that James Howard's [P81] father was also a James. We can deduce with some certainty that this was the James Howard who was buried at Thames Ditton Parish Church in 1788. A burial entry of an Ann Howard [P92] who was buried at Thames Ditton in 1808 aged 80 suggested that this Ann Howard was probably the wife of James Howard [P91] putting her birth at around 1725 and by deduction, that of James Howard [P91] to about the same date. Although there are significant gaps in the Thames Ditton Parish Registers covering the early 1700's I have reasoned from the total lack of entries in the earlier surviving Parish records dating from 1663-1695, that our Howard Family may have originated elsewhere. There are no Howard entries amongst the surviving baptism, marriage and burial records of the parish of Thames Ditton prior to 1695. Given that they must have come from somewhere and that in those days a 20 mile journey could take half a day - I decided to look at the neighbouring parish records for clues as the origins of this Howard Family. It didn't take me long to find entries in the neighbouring parish of Long Ditton and Tolworth where in 1722 a baptism entry for a John Howard [P115], son of James [P113] and Barbara Howard [P114] is recorded. Could this be a sibling of our James Howard [P91]? I had previously stumbled on to a Barbara Howard, noted as a witness at the Wedding of James Howard [P81] and Diana Robertson [P82] in 1782 at Thames Ditton but couldn't place here - could this be the same Barbara Howard who is noted in the Parish of Long Ditton and Tolworth registers? Is this James Howard's [P81] Grandmother? Other interesting entries were found in the Long Ditton and Tolworth Parish Registers. A baptism entry dated 11th October 1668 records the christening of a James Howard [P118] , son of William Howard [P126]. Mary, daughter of William and Mary was baptised on 30th August 1665. 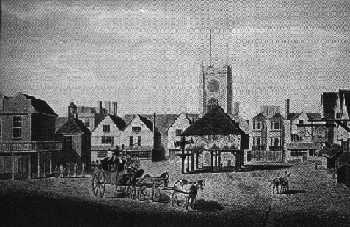 Could this be the William [P126] and Mary [P127] Howard who were married at Kingston-upon-Thames on the 10th August 1663 - Kingston-upon-Thames was a thriving market town as the following picture depicts and it was not unusual for members of outlying parishes to be married in the nearby market town in those days - seems likely as the location and dates all fit. Some of the earliest records I have found to date relate to the Howard family from Long Ditton and Tolworth and are from the Parish Overseer's Poor Rate Account books which have survived and are kept at the Surrey History Center now at Woking. In 1665 a Will Howard of Tolworth, thought to be William Howard [P126], was elected by the Parish to the post of Headborough (an old English name for the Parish Constable). It appears from these early records that unlike today, the Parish Constable was a post subject to annual election. William Howard must have served the Parish well as we find him elected to the post again in the years 1677 and 1690. Indeed, this post seems to have been one shared with other family members as a James Howard, thought to be William's son, James Howard [P118], was elected to the same post in 1694 and 1704. This research is currently continuing in an effort to support my theory that the Long Ditton Howard family and the Thames Ditton Howard Family are one in the same. A burial entry for one John Howard, buried on 1st September 1712, notes that he was the son of James Howard of Thames Ditton, adding weight to the theory that our Howard family may have originated from this Parish before moving into Thames Ditton. Two early marriage entries in 1693 and 1701 could be connected to our Howard family, certainly the marriage entry for James Howard [P115] and Sarah Brooks [P116] in 1701 fits the information we have identified as relevant to our Howard Family, a Sarah Howard [P116] was buried at Thames Ditton on 22 January 1768! The Thames Ditton Howards © Graham B. Howard 1997-2003. All Rights Reserved.